Now let’s see how well these boxes support IPv6. I’m describing the Data Center IPv6 deployment issues in the Enterprise IPv6 Deployment workshop. The diagram above was taken straight from the workshop materials. Routers and switches (both Catalysts running SXI release and Nexuses running latest NX-OS) support everything you need, including IPv6 layer 3 virtualization (IPv6 in VRF, also known as 6vPE). I couldn’t find 6vPE support in IOS XE Release 2, but then you’d most likely need it on the core switches, not on the edge routers. ASA is a bit of a problem – the current software release does not support failover configurations with IPv6. The situation rapidly worsens as you go deeper into the Application Networking Services. 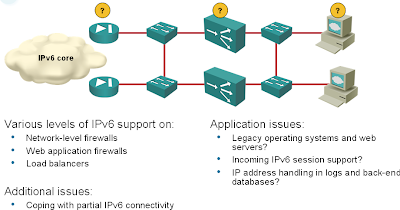 I wasn’t able to find any mention of IPv6 in ACE, XML Gateway or WAAS configuration guides. If I’ve missed something, please let me know. Firewall Service Module (FWSM) Not in transparent mode, on the main CPU (awfully slow) in routed mode. Not only does failover with ASAs and IPv6 not work, it's actively destructive, as both ASAs in a failover cluster send RAs. Which, I am pretty sure, cannot be that hard to fix. Yes I ran in to the same issue with an active/passive ASA cluster and IPV6. Found that te second ASA was reesponding to ND and RAs. The only way I could resolve this was installing a standalone ASA as an IPV6 gateway. Worked pretty well though. The ASA's also have issues with RADIUS authentication when you telnet or SSH to the device on its IPv6 address. Local authentication works fine. If you do any routing with 4948's and want to do EGIRPv6 they don't support it. PS. Ivan, why do you say 6VPE is not likely needed on edge routers? The edge is -exactly- where you need it imho. You need 6VPE on the Service Provider edge routers, not on the edge of a Data Center. You need 6VPE within the Data Center to implement L3 virtualization. Does anyone know if you can use PPPoE with IPv6 on an ASA ? ?